Maxearn has opened the newest 16,000 sqft central kitchen to expand its catering service in 2019. Our Korean Executive Chef and his team oversee the production of all our products to ensure the quality and freshness. Our HACCP qualified central kitchen provides tailor-made Korean ingredients and food to our clients. We work closely with our clients to provide a comprehensive and customized service that fit the most. 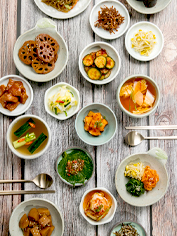 With our massive wholesale goods background, we provide an extensive Korean catering menu for businesses and individuals. People can now enjoy Korean food anytime and anywhere in their own functions. Today, our clients range from major chain restaurants, convention exhibition halls, hotels and concert venues. 2013 © Copyright Maxearn Ltd. All Rights Reserved.